West Bromwich Albion have described reports linking striker Saido Berahino with a £23m January move to Liverpool as "entire fabrication". 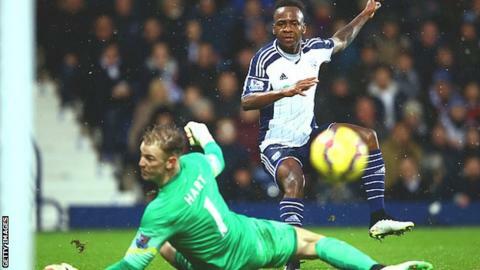 Berahino, 21, made an impressive start to the season, scoring seven goals in West Brom's first nine games. He earned an England call-up in November but has started just one of Albion's last five matches. The club said on Twitter: "This Berahino story for £23m is, and always has been, an entire fabrication." The Baggies academy product said in November he may have to leave the club to play in the Champions League. He has been linked with a move to Anfield, with Tottenham also reported to be interested. Following Berahino's first call-up to the England squad, West Brom began contract talks with the striker last month in a bid to extend his current deal beyond 2017.